It's as simple as buying a 12volt regulator from the vendors, no rewiring required. The generator will put out either 6,8, or 12 volt. Depends on the battery voltage in the car. However, the amperage output is proportionally reduced the higher the voltage. For example; if a 6 volt system puts out 10 amps, a 12 volt system will put out half of that...or 5 amps. An 8 volt system will be approximately 6.5 amps. The Model T Ford generator is a current source with a maximum capability of 100 Watts. The generator design is marginal and if continually operated at its upper limit it will quickly fail. During the Model T era when cars had 6 volt batteries and were driven at slow speeds and short trips using Fords recommended charging rate of 12-14 Amps the generator was operating INTERMITTENTLY at peak capability. Today we drive Model T's at faster speeds and longer trips and are operating the generator CONTINUALLY at the top end of its designed limit. They get very hot and fail. So what to do? When driving today if the charging system is in good order you only need to charge a 6 Volt battery at a rate of 5-7 Amps to keep the battery fully charged AND use a FunProjects voltage regulator thereby limiting the charging based ONLY on the battery's need at a reduced generator power dissipation. If you use a 8 or 12 volt battery the charging rate must be proportionally reduced the charging as Kevin points out. The calculations of that limit is mathematically different. The Model T generator is a good reliable device, but you must play by the rules or it will serve you well. As I love to say; the world is paved with abused and failed Model T generators. Oops, the second to last sentence should read; The Model T generator is a good reliable device, but you must play by the rules or it will serve you poorly. First off you do NOT want to ever operate a T generator with the 3rd brush set to maximum. Right now with battery fully charged the VR has your generator shut down but if you run the battery down much at all then the VR will allow the generator to charge at the maximum rate your have your generator set to and that unfortunately can and WILL exceed the limits of the generator. I would caution folks to typically NOT set the generator more than about 1/2 the mechanical adjustment range. You should be able to put out 10-12 amps in that position which is enough to offset the discharge of your lights on a night run. Follow the instructions that came with your VR and follow them TO THE LETTER so as not to hurt your generator. Are you using an accurate analog meter for your readings? The VR will not allow nor do you want the output of the VR to be more than 7.05V It will typically be in the 6.95 to 7.05 Range once the battery gets near full charge. This voltage is at the screw terminal of the VR to ground. Start by measuring it there. If you get way less at the battery then you might have some high resistance wiring in the charge path. Some harness' were built with wrong gauge wiring in the charge path. I just posted this info on another thread where the fellow had a "bouncy" ammeter - go read that thread for info on the wrong size wiring that is sometimes found in T's. John for some reason I had thought the 3rd brush should be a max. I went back and reviewed the installation instructions and it does say to limit the rotation of the 3rd brush so that the max output is 10-12 amperes. I'll change this. I am measuring with a Simpson 260 meter at the VR terminal and see at most 6.8 volts. Tried a Fluke digital and it reads the same. The setting of the main brush "neutral point" sets the reference point and affects the third brush setting so I wonder if you had any issues setting the main brush assembly to neutral. When I find someone has trouble getting much current out of their generator it usually is caused by the neutral setting not being quite right when all else seems OK. If you truly are getting 6.8V at the VR and it is not a case of the meter being just off a bit, I would wonder what your ammeter says since generally when the VR is setup to 10-12 amps but is then showing 2 amps or so of charging at high RPM then it would mean the battery is not holding the Voltage down so you should see something very near to 7V at the VR screw terminal. Whatever the reading at the VR if your battery is fully up and lights are off then you should see the exact same reading across the battery since there is no charge current being drawn by the battery. Assuming you are running coils on magneto that means zero load current there too. Well..... 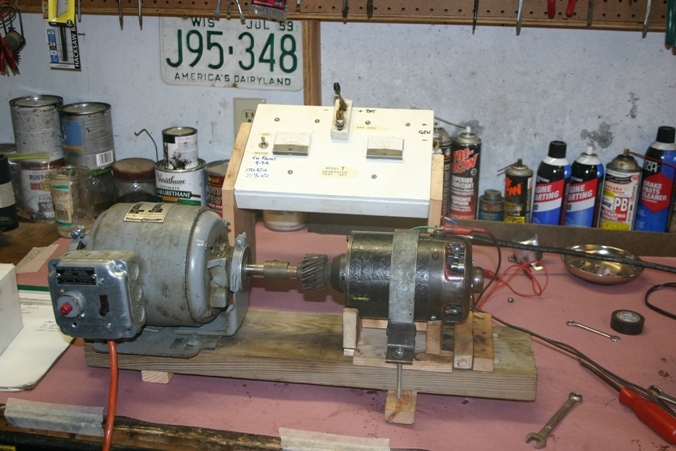 I had some time today and I took the generator off and installed it in my bench jig.